I just finished up my IPv6 session at Microsoft TechEd - thanks to everyone who attended, really appreciate you took the time to come hear me talk. I promised to provide some of the content references. I have to confirm with Microsoft I can publish the deck that has the full comments in it (they were removed from the deck available for download) before I can publish anything. If you attended my session please feel free to reach out to me and I will see what I can do to get you specific information (like sample configuration files.) Please remember to fill out your evaluation for my session too! If you are interested in starting to play with IPv6 there are several resources to do so. If you want to set up a IPv6 tunnel from your router then try out tunnelbroker.net which is run by Hurricane Electric. You will need to set up an account to use the service. If you want to try it out on your Windows 7 or Linux client use freenet6 which is a free service from gogo6. You will also need to set up an account to use freenet6 too. 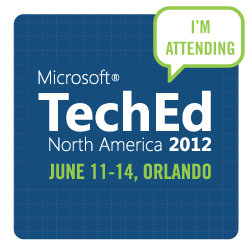 I will be heading out to Orlando on Sunday to present my IPv6 Bootcamp session at Microsoft TechEd. I'm pretty excited as this will be my first time presenting at TechEd and a chance for me to address a different audience then I typically present too. I've done plenty of IPv6 specific conferences and they are a different focus. People attending those are attending specifically because they want to learn IPv6. TechEd is different, folks are attending it because it is the biggest Microsoft event where you can hear directly from Microsoft about their products and technologies. So this is a rare opportunity for me to broaden my reach to those who might not be as familiar with IPv6 and why it is important. I hope if you are attending Microsoft TechEd that you will swing by Tuesday morning (my session starts at 10:15am - WCL324) and come learn some IPv6, ask questions and hopefully expand your horizons about why IPv6 is going to be a critical topic to know now and in the near future. I have to admit, there are times when I get tired of watching some companies and industry folks claim IPv6 expertise when clearly they are just jumping on the bandwagon. I am grateful for the current interest in IPv6 that is pushing adoption forward and I have been impressed with lots of companies who have been waving the flag for years now and have put their money where their flag waving is. For those who are new and trying to figure out who is legit in the IPv6 arena I think the easy way is to see what events a company has sponsored over the years. If they have helped in regional IPv6 Task Force summits or conferences or have run their own IPv6 events for more then a year or two they are likely legit. The same goes for speakers and industry experts. If you are talking to someone and they claim to have been working with IPv6 since 1995 or such nonsense you can call bull - the RFC (2460) didn't come out until Dec 1998. Unless they were working with Bob Hinden and Stephen Deering on the draft (not very likely) then they are full of it. To be honest, I have been slightly alarmed at recent IPv6 events I have been attending where I am chatting with folks and a new person I get introduced to claims to have years of industry experience deploying IPv6. I am far from a long timer in the IPv6 community but due to my position on the California IPv6 Task Force and my regular attendance at IPv6 events across the country I think I am relatively familiar with the majority of regular speakers and presenters who have real world IPv6 experience and relevant information to share. Often when I ask around these self proclaimed experts are not known by any of my colleagues. I ask because I'm relatively new to the IPv6 community. I've been fortunate enough to be on panels or presented at conferences with the likes of Jeff Doyle, Scott Hogg, Shannon McFarland, Ciprian Popoviciu, Silvia Hagen, Bob Hinden, Jeremy Duncan, Yurie Rich, John Curran, Owen DeLong, Stephan Lagerholm, Shane Amante, Yanick Pouffary, Jason Fesler, Tom Coffeen, Ron Broersma, Lorenzo Colitti, John Jason Brzozowski, Dan Wing, Eric Vyncke, Andrew Yourtchenko, Mark Townsley, Dave Ward, Erik Kline, Vint Cerf, Chris Grundemann, Salman Asadullah, Elise Gerich, Bruce Sinclair, Jordi Palet , Tony Hain, Stan Barber, John Baird, Joe Klein, Joesph Davies, Chris Palmer, Dave Thaler, Martin Levy and countless others who are regular IPv6 contributors. The contribution level varies but it has been very exciting to say I've been involved in a small way with this community of impressive individuals. Clearly my list of folks is heavily biased on individuals participating in North American conferences and events and the list would be massive if the rest of the world was included. I wish I could keep a complete list of folks who have true IPv6 expertise but I think the days of having a manageable list are over. Am I crazy to be concerned about this? I am not sure, the reality is we want more and more folks to adopt and use IPv6 and as that happens the rising tide will lift everyone to greater IPv6 proficiency and eventually expertise. This is a good thing so I guess I will calm down and stop being concerned about too many people getting on the bandwagon, after all, that is the point of all of this!